Business processes are the mechanisms through which every organization’s products and services are created and delivered to their customers. In these days world of global competition, your organization’s critical processes need to be built around best practices that minimize cycle time, maximize throughput, and build supply partnerships with critical end-use customers. IQMS Business Process improvement training program is a highly effective means of transferring process management and improvement skills to key employees in your organization. 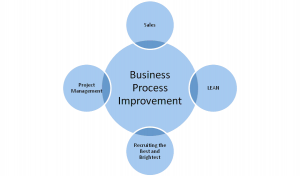 IQMS Business Process Improvement training help trainees to understand the importance of business process improvement of the organization. IQMS have expert domain trainers for process analysis and design benchmark client processes against the best in the industry and provide solutions based training on the vision of the company. Our Business Process Improvement training is a consortium of business analysts and quality practitioners, who bring in their process improvement experience along with expertise in using analytical tools. Our Business Process Management training program provides the foundation as well advanced skills for effective process management and breakthrough improvement. Trainees are provided with hands-on use of a change management process and lean Six-Sigma tools for analyzing business processes, solving business problems, and implementing best practices. Participants take away learning that can be applied to successfully improve your organization’s critical processes and create unique competitive advantage.